Probably the most important function of a website today is being found in the search engines, which will bring potential clients to a business. 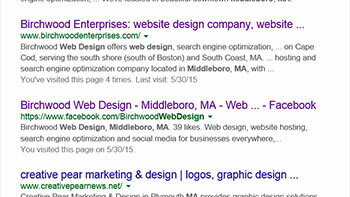 If your site is not on the first page of the search engine results pages, chances are that it will never be found. Research shows that 90% of visitors do not go past the first page. We have kept up with search engine optimization techniques for the past decade, and have had great success getting our clients on the first page of Google (the biggest search engine) for their local keywords. Every site created by us is optimized for organic search results. The “organic” search listings are those that are not the paid ads that you see on the right and usually at the top of the search results page. This is important because many users will skip over the paid ads, preferring to find a business that just comes up naturally in the search results. We research keywords that are used to find your products and services, including keywords that you feel your clients use to find you. Google is ranking sites the highest when they are content-rich. They want to see sites that have a lot of information, as these sites will typically be the most helpful for the users. While we do not typically write the content for our clients, we can do that as an added service. We also advise our clients on how and where to use keywords in their content to get the great search engine optimization. Our clients are mostly on the South Shore, South of Boston and Cape Cod.